The Wax Plant (Hoya carnosa) is not a plant you will find in many people’s houseplant collections. This is unfortunate, as it is one of the most unique and hardy indoor tropical plants. The common name comes from the texture of the leaves. They are very thick and firm, with a smooth surface. They look almost artificial. The Wax Plant is a bit more pricey than the more common tropical plants, but well worth the splurge, and the effort to find one. It is a great vining plant. It will readily climb a trellis, and is often sold on a round frame. It is fairly fast growing, and frequent pruning encourages thick new growth. 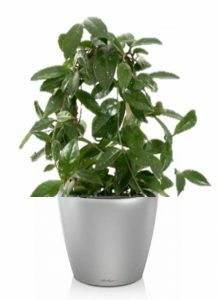 This plant does require good bright light, but is tolerant of dry air and can handle temperature changes well. We often hear of people having a Wax plant for many years. The most interesting feature of this plant has to be its flower. Given enough light, a Wax Plant will produce parachute shaped clusters of star-shaped, white, pale or bright pink flowers with five-point centers. The flowers are very intricately detailed and so uniformly shaped they’re sometimes called Porcelain Flower. The flowers are so uniform that they look like plastic imitations. They have a very sweet odour and may form drops of sticky nectar. Several varieties of Hoya are available. Some have dark green leaves with silver flecks, other are a variegated green and lemony cream colour. A newer variety has leaves tinged with pink. 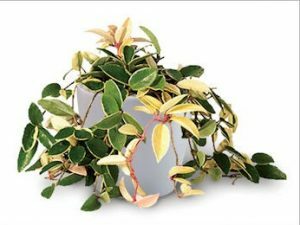 The Wax plant prefers a soil with a high percentage of peat moss to retain moisture. It does need good drainage though, as it will not tolerate constantly wet roots. Allow the soil to dry slightly between waterings, and water more sparingly in the winter. A good quality fertilizer is important. Fertilize once per month during the spring, summer and fall.